About two weeks ago I've found the new Lufthansa Worldshop catalog in my mail. 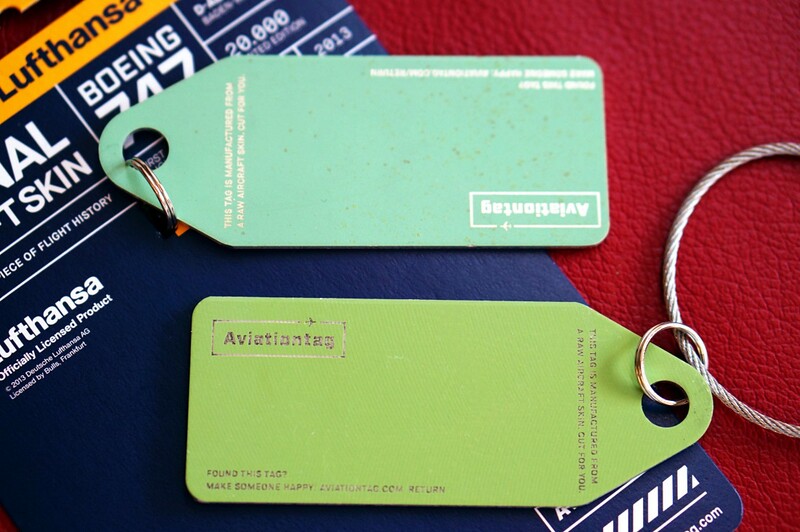 I've ordered two of the exclusive aviationtags right away. Each aviationtag is precisely laser-cut out of actual aircraft aluminum skin, in case of my tags the Lufthansa Boeing 747-400 D-ABVC “Baden-Württemberg”. This aircraft clocked 100,000 flight hours on 12/26/2008, and has since been scrapped at MZJ (Marana, USA). 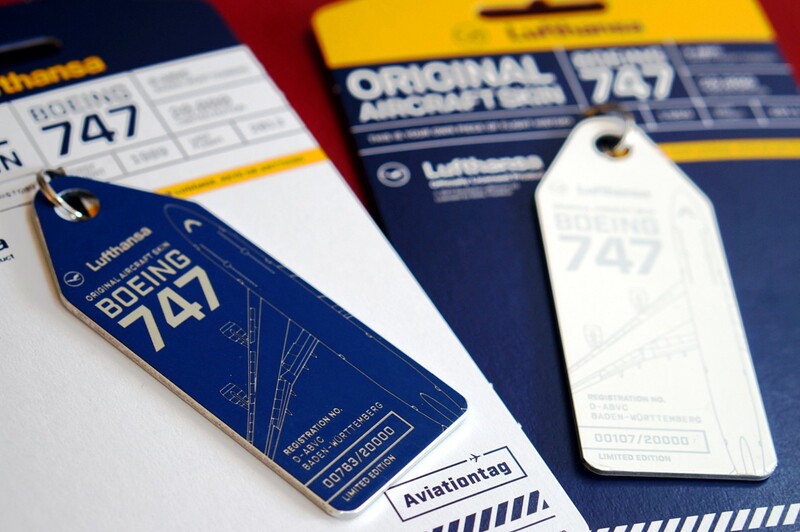 The Lufthansa aviationtag comes in two colors: white and blue. I've had a few spare miles, so I've ordered both variants. Each tag is limited to 20,000 and individually numbered. You can register your tag, so if your keys or luggage get lost it might be returned to you. I was a bit anxious when I opened the package today. I was expecting something along the lines of a coke can, cut by hand with pliers. The material, however, is much thicker than expected, and cut very precisely. The front side has got etched text and the drawing of a Boeing 747, while the back still wears the original green anti-corrosion paint. To warp it up, I have somewhat mixed feelings on the aviationtag. They are of good quality, no doubt about that, but at a price of about $20 each they are definately a gift for the aviation enthusiast (like me). It is certainly nice to know that this piece of metal travelled around the world for more than two decades, and I was lucky to have paid for them with spare miles. The point is that I'm not quite sure what to do with them: they feel a bit too big to put on my keyring (there's currently a red fabric flag from a safety pin which is quite worn and needs replacement), and I want neither my pockets to be ripped open nor the tag to be scratched by my rather large keyring. Maybe I'll take the plunge and try them out in a few days.